/BigMIND /Policies /How can I delete unwanted policy? Click on the Delete icon ( ) next to the policy that you wish to delete. A confirmation Delete Policy box will be shown. Confirm by clicking OK. Select the Policies option from the left side menu. Clickon the Delete icon ( ) next to the policy that you wish to delete. 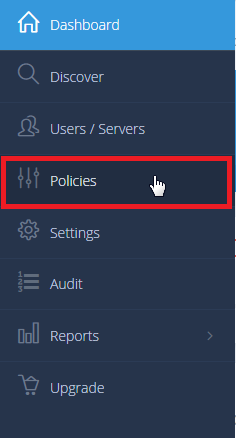 Policies that are being used and assigned to users cannot be deleted, you need to assign the users to another policy or remove this policy completely from the user and revert the user account to its User Defined status.